How Much Does Fiber Internet Cost in Washington D.C.
As the Internet takes an increasingly dominant role in the lives of ordinary people, it also plays a progressively important part in the business world. Extremely fast, wide-bandwidth connections were once considered to be the realm of digital enterprise alone. But today, they are emerging as a vital necessity to keep businesses of all sizes competitive and operating efficiently, no matter what the industry may be. Whereas corporate connectivity used to be critical only to businesses that provide digital products (such as a Netflix, Twitter or Facebook), today we all use the Internet to perform everyday operational tasks, like accessing stored files, running applications, emailing and even making phone calls. Of course, as customer support operations increasingly favor online environments, this shift also requires more bandwidth, and the larger the company or, the greater the volume of customer support, the greater the insatiable desire for more bandwidth. How Much Does Fiber Optic Internet Cost in the D.C. Metro? One major advantage of business-grade fast Internet is the ability to trust that you’re always connected, and with the rapid adoption of fiber-optic internet, this level of dependability is within any company’s reach. 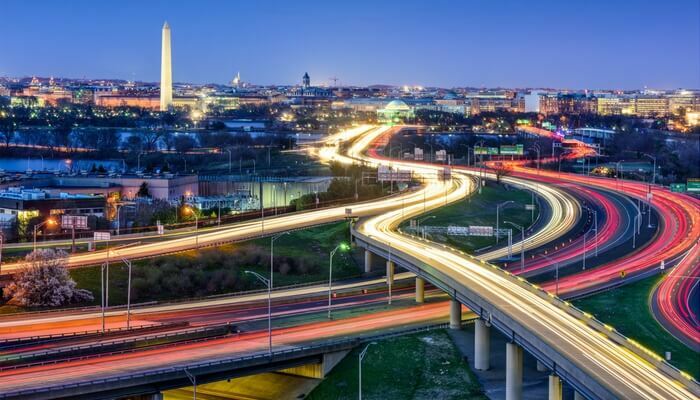 In the Washington D.C. metro area, the confidence afforded by fiber internet is increasingly critical to running a business. If you haven’t switched to fiber yet, you may be surprised by how affordable and flexible your service options are. There are several factors that influence the bottom line, so if you’re looking to minimize the impact that fiber will have on the expenses of your greater DC-based business, read on to learn more. Fiber Internet in Washington D.C.
For starters, let’s note that your business location’s proximity to existing lit fiber lines usually has the most significant impact on the costs involved with installation. If fiber is already in place in your building, then you are well situated, as you’ll be exempt from investing in the installation of the actual fiber lines. Proximity makes a huge difference, and if the nearest accessible fiber is on the next street over, or several blocks away, or the next city over – each will make a difference to the availability and, therefore, cost to you. Similarly, if the appropriate conduit is already in place, or easy to install, then that will save you funds that would have to be spent on a more challenging implementation process. If your business does not own the building, make sure to negotiate favorable terms for access with your landlord. Some may want to charge extra fees to give tenants the rights to introduce fiber conduits to the premises, while others may be open to shouldering the investment on their own, in order to add to their property value. Using fiber for high-speed internet also places a greater power burden on your work setting. If you have sufficient electrical infrastructure available already, then this can go a long way towards keeping spending to a minimum. On the other hand, if you don’t yet have viable power lines in place, you may find an onsite generator to be useful and affordable. One way or another, though, you’ll want to prepare for continued operations in the absence of utility electric power. And finally, make sure that you have enough space in your “telephone room,” the communications center where all the boards, circuits and lines in your building converge, to add fiber cables and switches as well. If there’s already enough space in there, then the relative savings involved with fiber installation can make a big difference. Even when you know full well that you want fiber for your organization’s high-speed Internet, it just makes good sense to embark on the decision carefully. While this change is a significant positive in nearly every situation, it does involve investment and isn’t one to take lightly. Some service providers try to lock customers in with manipulative and high-pressure sales pitches that keep you from sorting out all of the information you need to make sound decisions. Make sure when you’re evaluating your options that you ask specific questions and insist on getting straightforward answers with all of the details you need. When you receive a price quote, make sure it’s itemized with all of the factors that influence pricing. Make sure you understand what services and equipment are included in the rates you’re offered, so you know what additional spending will be necessary. Companies have been turning to us for help deciding between copper and fiber telecommunication circuits for several years. 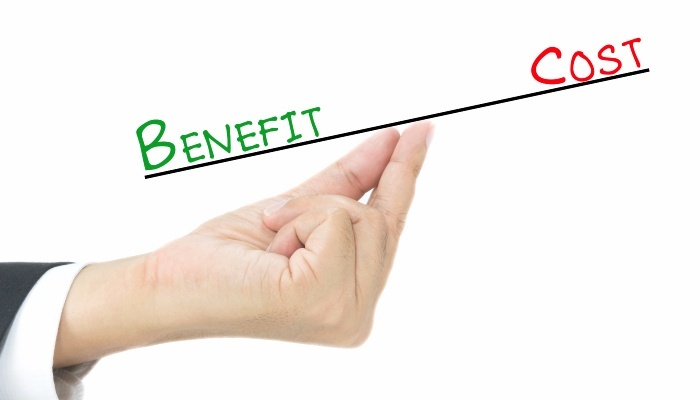 From our perspective, the best way to go about making this choice is to familiarize yourself with the specifications, attributes, advantages and disadvantages of both. The fact is, when we compare copper wire with fiber optics, although the technology used to connect is different, the Internet experience for the end user is largely the same. That’s why this decision is primarily a “behind the scenes” one. Fiber-to-the-Premises (FTTP) Internet service involves fiber-optic lines running from a central hub to your office location. Data transmission over fiber is fast as it travels at the speed of light, and generally, it’s inexpensive to connect in a building that is already "lit". Fiber is also less susceptible to potential harm from the elements. On the other hand, it may not be available everywhere. Copper connectivity is fundamentally the basic wiring that you likely already have in place in your office building's telecommunications infrastructure. There are several reasons to use copper, including greater affordability and availability than fiber. The technology is slower, but depending on your business needs, the difference may be unnoticeable and therefore not worth paying extra fees. With a solid service provider connecting you via copper, you likely have the option to go with a plan that supports speeds that are fast enough for many uses. The single most important factor in determining whether your business will best be served by fiber or copper for your Internet access is availability. We recommend that you always begin by investigating the options supported by the infrastructure in your locale – the decision may be easier to make than you’d even like it to be. How fast do you need your Internet connectivity to be? How much bandwidth do you anticipate requiring? What size files do you need to access, download and upload in what frequency? What services do you use that require agile transfers of relatively heavy data, and how many people need to use these services at the same time? For some businesses, short connectivity lapses may prove incidental, while for others, being online at all times is mission-critical. If your company runs on cloud-based apps or databases, then even a few minutes of unreliable or slow Internet makes for significant compromises. Make sure that the hardware and equipment that you already have in place is all compatible with both copper and fiber options and the switches and interfaces that these infrastructure models require. If your setup is made to work with one and not the other, then the decision is out of your hands – or you will need to invest in far more than connectivity. Check your building’s wiring and your routers in addition to your computers. 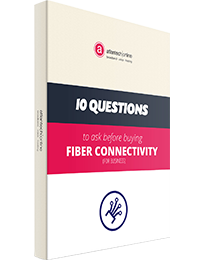 Even if you are technically able to opt for fiber, you may decide that it isn’t worth the investment at this point in your business’s growth trajectory. Making sure you can afford your connectivity solution is critical. Although the cost of fiber is often lower than people expect it to be, and the service contracts involved are often exceptionally flexible, budgetary constraints are real considerations for everyone, regardless of the investment decision at hand. Your decision regarding which type of Internet connectivity to opt for is ultimately dependent on your team’s data access needs – both in terms of volume and reliability – as well as the availability and the budgetary impact of each option. These factors are numerous and complex, and the decision you face can be daunting. Feel free to reach out and speak with the expert consultants at Atlantech, who can match your business needs and goals with the services available in your area to find the best solution for you. If you’d like to speak with us here at Atlantech, we’ll be happy to provide you with answers to any questions you may have, to put you at your ease and to give you confidence in the fiber solution you opt for, whether it’s ours or someone else’s. Our business connectivity support professionals can explain everything you want to know about fiber internet, from what it takes to bring it into your building, to what services you need to meet your goals, to how much you can expect to pay for every aspect of the implementation and ongoing service. Get all the information you need to make the smartest decision for your business' internet service.